(1) S'rî S'uka said: 'At a distance of thirty-eight thousand yojanas beneath the base of Pâtâla [*] is situated He who, as a part of the Supreme Lord, relates to the darkness and is called Ananta [the eternal one]. Scholarly Vaishnavas describe Him as Sankarshana, the ruler of the ego or I that is characterized by self-awareness [pride, identification], because He unites - 'draws together' - the seer and the seen, the subject and the object [see also 3.26: 25 and 4.24: 35]. (2) The celestial sky around the earth, this universe, sustained on only one of the thousands of hoods of the Supreme Lord in the form of Anantadeva, is seen as a [tiny] white mustard seed [like a single galaxy among many, many others in deep space]. (3) Because of His desire to destroy in the course of time this world, a Rudra [an incarnation of Lord S'iva] named Sânkarshana ['He born from Sankarshana'] arises from between His angrily contracted, beautiful eyebrows. He manifests in the form of eleven three-eyed expansions holding up pointed tridents. (4) With the effulgence of the glittering earrings that decorate their cheeks, the leaders of the snakelike souls, who, together with the best devotees in unalloyed devotion offer Him their prayers, see in the round surfaces of the brilliant pink gemlike toenails of His lotus feet their faces beautifully reflected. It is a sight that enraptures their minds. (5) The marriageable princesses of the serpent kings, hoping for His blessings, smear, with an ointment of saffron, aloe and sandalwood paste, the gleaming roundings of His auspicious, beautiful, spotless, fair arms resembling columns of silver. With their hearts in the contact beating faster with the ecstasy of Cupid, they, with attractive delicate, beautiful smiles, bashfully look at His, in love delighted, rolling, reddish eyes and kindly glancing lotus like face. (6) He, Ananta, is the Supreme Lord, the reservoir of all transcendental qualities and the original Godhead who, in restraint of the force of His intolerance and wrath [belonging to his mission of destruction], resides [in His abode] for the welfare of all [the living beings of all] worlds. (7) Being constantly meditated upon by scores of enlightened and unenlightened souls, the semi-divine snakelike souls, the souls of perfection, the heavenly singers, the souls founded in knowledge and the wise, He, in rapture under the influence, rolls His eyes to and fro. With the nectar of a fine choice of words and sweet song, His associates, the leaders of the different groups of demigods, please Him whose luster never fades, He who is ever fresh with the fragrance of the tulsî flowers that with their honey madden the bees about His, thus even more beautiful, Vaijayantî flower garland. Clad in blue, with only a single earring and the beauty of His auspicious hands placed on the handle of His plow, He, wearing a golden belt and as invincible as the elephant of the first one among the gods, Indra, is engaged in His transcendental pastimes as the Supreme Lord in person. (8) They who seek liberation and, by the tradition [the paramparâ], hear about the glories of this one Lord, will very soon cut with the age-old knot of mâyâ consisting of passion, goodness and ignorance that, as a consequence of the propensity for karmic actions, was tied firmly in the core of their hearts. Third revised edition, loaded July 23, 2018. S'rî S'uka said: 'At a distance of thirty-eight thousand yojanas beneath the base of Pâtâla [*] is situated He who, as a part of the Supreme Lord, relates to the darkness and is called Ananta [the eternal one]. Scholarly Vaishnavas describe Him as Sankarshana, the ruler of the ego or I that is characterized by self-awareness [pride, identification], because He unites - 'draws together ' - the seer and the seen, the subject and the object [see also 3.26: 25 and 4.24: 35]. The celestial sky around the earth, this universe, sustained on only one of the thousands of hoods of the Supreme Lord in the form of Anantadeva, is seen as a [tiny] white mustard seed [like a single galaxy among many, many others in deep space]. Because of His desire to destroy in the course of time this world, a Rudra [an incarnation of Lord S'iva] named Sânkarshana ['He born from Sankarshana'] arises from between His angrily contracted, beautiful eyebrows. He manifests in the form of eleven three-eyed expansions holding up pointed tridents. With the effulgence of the glittering earrings that decorate their cheeks, the leaders of the snakelike souls, who, together with the best devotees in unalloyed devotion offer Him their prayers, see in the round surfaces of the brilliant pink gemlike toenails of His lotus feet their faces beautifully reflected. It is a sight that enraptures their minds. The marriageable princesses of the serpent kings, hoping for His blessings, smear, with an ointment of saffron, aloe and sandalwood paste, the gleaming roundings of His auspicious, beautiful, spotless, fair arms resembling columns of silver. With their hearts in the contact beating faster with the ecstasy of Cupid, they, with attractive delicate, beautiful smiles, bashfully look at His, in love delighted, rolling, reddish eyes and kindly glancing lotus like face. He, Ananta, is the Supreme Lord, the reservoir of all transcendental qualities and the original Godhead who, in restraint of the force of His intolerance and wrath [belonging to his mission of destruction], resides [in His abode] for the welfare of all [the living beings of all] worlds. Being constantly meditated upon by scores of enlightened and unenlightened souls, the semi-divine snakelike souls, the souls of perfection, the heavenly singers, the souls founded in knowledge and the wise, He, in rapture under the influence, rolls His eyes to and fro. With the nectar of a fine choice of words and sweet song, His associates, the leaders of the different groups of demigods, please Him whose luster never fades, He who is ever fresh with the fragrance of the tulsî flowers that with their honey madden the bees about His, thus even more beautiful, Vaijayantî flower garland. Clad in blue, with only a single earring and the beauty of His auspicious hands placed on the handle of His plow, He, wearing a golden belt and as invincible as the elephant of the first one among the gods, Indra, is engaged in His transcendental pastimes as the Supreme Lord in person. They who seek liberation and, by the tradition [the paramparâ], hear about the glories of this one Lord, will very soon cut with the age-old knot of mâyâ consisting of passion, goodness and ignorance that, as a consequence of the propensity for karmic actions, was tied firmly in the core of their hearts. Those after liberation who by mouth of the tradition hear about the glories of this one Lord, find the knot that since time immemorial of the illusory energy, consisting of passion, goodness and slowness, in the unconscious of fruitive action was tied in the core of their hearts, very soon cut. 'How can one with certainty understand the path of Him who is one of Soul and diverse in His manifestation, of Him of an unlimited form that has no beginning, of Him by whose glance the basic qualities of material nature - headed by goodness - were enabled to function as the primary causes of creation, maintenance and destruction? Out of His mercy for us He, completely transcendental to this manifestation, exhibited His existence in different forms, He who, reclaiming the minds of His devotees, in His pastimes shines as the most liberal and powerful master of all beings, capturing them by His spotless example. Any person in distress who accidentally heard about Him or any fallen soul who, just to participate, repeated or chanted His name, shall instantly see the endless sinfulness vanquished that characterizes human society. Of whom else but Lord Ananta S'esha should any seeker of salvation take shelter? 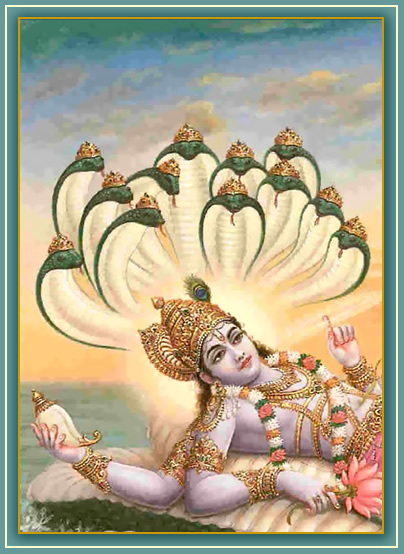 Whoever, however many tongues he would have, can count the Supreme Lord’s potencies? There is no end to His unmeasurable powers. This universe with its mountains, trees, oceans and beings, is nothing but an atom fixed on one hood of Ananta, He who has thousands of hoods. I thus have described, the way it has been instructed to me, the truth of the destinations that, depending the karma, can be reached by - and were created in respect of the wishes of - those who desire material pleasures. *: The mentioning of distance in relation to the transcendental reality of Ananta suggests a physical correlate in the universe that compares to the darkness of intergalactic space which, as an organic existence of eternity, purity and divinity or void of self, envelops all the galaxies in the cosmos, giving each his own 'snake' foundation in the darkness of an awareness of 'I'. The actual shortest distance between the center of our stellar system and the outerspace of darkness below it is about 3500 lightyears. The picture is a detail of a Hindu picture of Ananta Vishnu.